Dar Lighting Almeria medium ceiling light pendant features a cylindrical drum shade with ivory white cotton which promotes fantastic light diffusion. 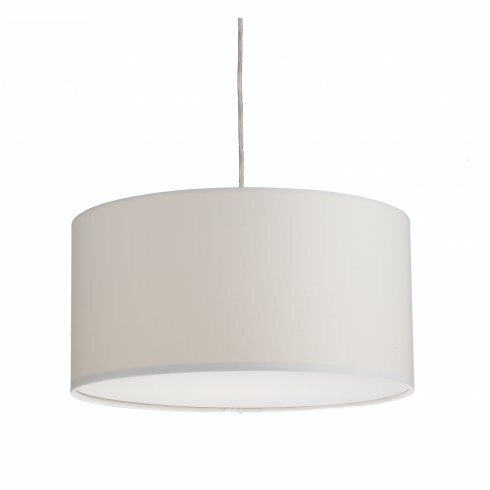 The product code for this Dar ceiling light pendant shade is ALM1615. Easy Fit pendants in designed in such a way as to allow to simply fix them to a pre-existing cable and lampholder. These are not included with this product, however they may be ordered separately and can be purchased from our website by searching for suspension kits. This item may be manufactured to order so please allow 2-3 weeks for delivery. Just one of the many ceiling light pendant shades designs that we showcase on our website, this shade is also available in black, and in a smaller and a larger size.